Apes With iPads: Stephen Colbert Finds America’s Next Big Terrorist Threat (VIDEO). Now that you have seen the humorous side, lets look into the real value of the Apps For Apes program. 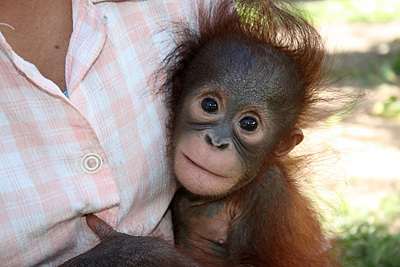 DID YOU KNOW: Palm oil is killing about 50 orangutans per week, and thats on top of palm oil being bad for your health! 300 soccer fields sized areas are cleared every hour in SE Asia so that palm oil can be produced. Palm oil is a hidden ingredient in our food. You can help by only buying labeled palm oil products and give the Orangutans a chance. 1. More than a thousand Orangutans die every year because their habitat is destroyed for palm oil. 2. Palm oil is in about 40% of the food products in our supermarket, but you often don’t know it becuase it’s not labeled. 3. By labeling palm oil we have a choice about whether our food is adding to this crisis. Orangutans are highly intelligent creatures and they require mental stimulation to keep from growing bored and depressed. Every orangutan is a unique individual with his or her own particular likes and dislikes, and freedom of choice is critical to their well-being. They like to choose everything from their afternoon snack to their daytime companions and sleeping area. What they do each day depends on how they feel, and the more choices they have, the better. Just like humans, orangutans like options. The quality of life of orangutans living in zoos and sanctuaries is dependent on the amount and type of enrichment they receive on a daily basis. With the Apps for Apes project, we propose to introduce Apple’s touchscreen technology to orangutans in order to provide them with unlimited enrichment opportunities. 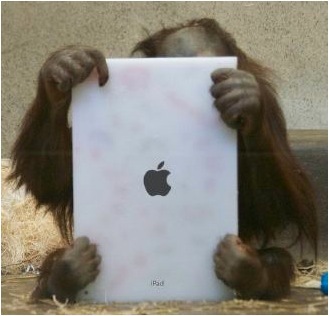 The Apple iPad is a perfect device for orangutans, as their innate ability to work with touchscreen technology has already been demonstrated in facilities such as Zoo Atlanta and the Smithsonian National Zoo. With proper guidance, orangutans will be able to use their devices just like humans do– to spend their time doing things that they enjoy. They will have access to music, games, movies, cartoons, art, painting, drawing, photos and videos. Among other things, they will be able to see photos and videos of other orangutans. Apps for Apes will be especially beneficial for orangutans living in zoos in Northern climates. During the long winter season, these orangutans spend long stretches of time in their indoor holding areas. The devices will allow them to have a virtually unlimited supply of mental stimulation literally at their fingertips. 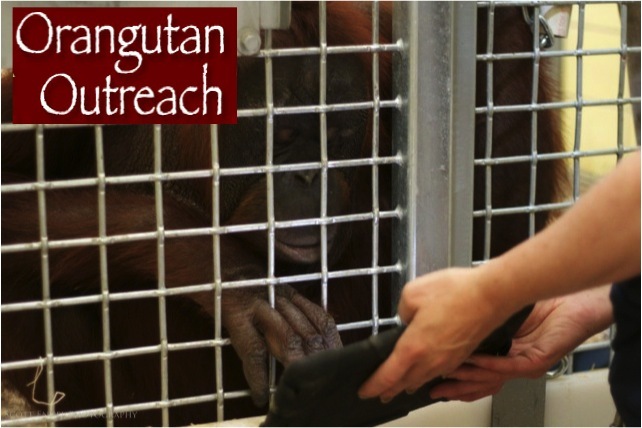 The device will also be incredibly useful for educating orangutans in rehabilitation programs. It can show images of foods they can eat as well as those to avoid. They will be able to learn about predators and learn how to climb and navigate their way around the treetops by watching video footage of orangutans in action. After learning about this program, Olivia asked if we could reach out to see if Richard would talk with us about his program and how OMG might be able to help. So we did just that. We called Richard and told him what the kids wanted to do to help and he was very excited. He even took time out of his busy schedule to grant the kids an interview where they got to ask Richard anything they wanted. They both had a blast. Since that initial call, we have been in contact with the Primate Curators at Zoo Atlanta and we are scheduling a meeting to discuss how we might create an educational event at the Zoo in the coming months where we could help visitors learn more about these creatures and hopefully raise a few donated iPads for the program to be carried out right here in Atlanta as well. Since starting our efforts to raise iPads in support of this program, Olivia and Carter have been able to raise two iPad-2 for the Apps For Apes program. The first donated iPad came from Carter and Olivia’s classmates and friends Sara and Jason Short. They listened intently as the kids explained Richard’s vision of getting a iPad-2 for all 16 zoo’s in the US with orangutans and they decided to help. The first few questions Carter asked of Richard. Why did you start the Apps for Apes program and what made you want to start the program? The primary mission of Orangutan Outreach is to protect and care for orphaned and displaced orangutans in Indonesia, but we are also concerned with the well-being of orangutans in zoos and sanctuaries. We will do whatever we can to improve the lives of orangutans anywhere. We’ve worked with zoos for several years to raise awareness among visitors about the terrible situation facing orangutans in the wild. The orangutans in zoos are, in a way, ambassadors for their wild cousins. Orangutans are incredibly intelligent and curious. They need lots of stimulation to keep from being bored or depressed, and enrichment is a key to improving their lives in captivity. In a zoo situation– where orangutans are not being rehabilitated to go back into the wild– there is every reason to let them ‘play’ with new tools. Orangutans have used touchscreen computers for a while now, and when the iPad was released, it struck me as being the perfect device to provide an infinite amount of mental simulation for orangutans. How many Orangutans have you worked with? I have not worked hands-on with orangutans. I work in the background raising awareness of the crisis facing orangutans in the wild and raising funds for rescue operations in Indonesia. This includes both rescue teams and facilities. Orangutan Outreach, in partnership with organizations on the ground, helps care for hundreds of orangutans. When did you start working with Orangutans? 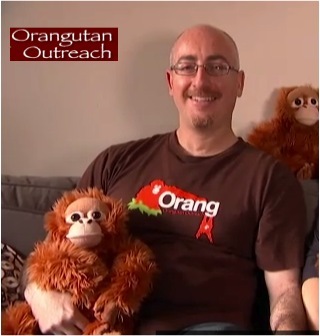 I founded Orangutan Outreach in 2007. I’ve loved orangutans my whole life and have contributed to orangutan conservation for about 15 years. It’s too hard to choose, although the orangutans being cared for at the Ketapang Orangutan Center are very dear to my heart because I was physically involved in the actual rescue of many of them. I love all orangutans unconditionally and am quite fond of many orangutans in zoos who I’ve frequently gone to see over the years. Where have you traveled to talk about the Orangutans? 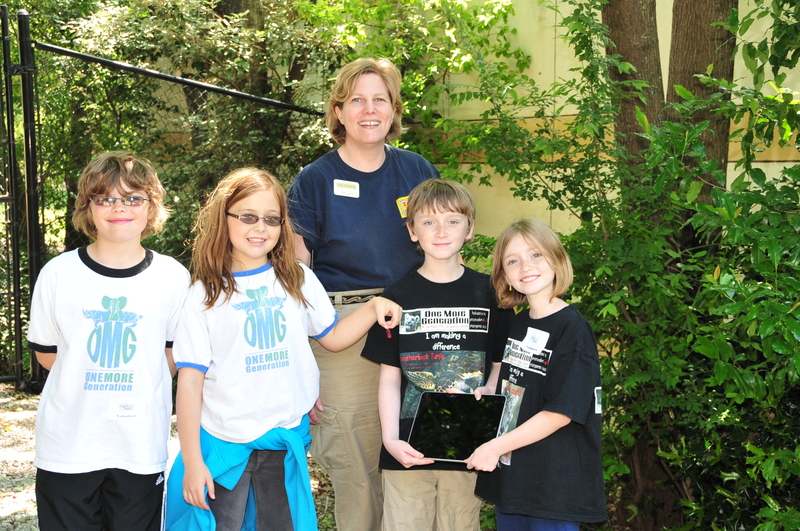 By helping to raise awareness– especially among other young people– of the crisis facing orangutans. We need to get more kids involved! Orangutan Outreach has been working with kids from the very beginning and you can join forces with our Youth Ambassadors, Madi Vorva and Rhiannon Tomtishen and our other young supporters. When we all work together, we are much stronger than when we try to do everything ourselves. What is your favorite animal (besides Orangutans) and why? No animal in particular, though I’m fascinated by parrots and owls. I never grow tired of watching giraffes, elephants and other megafauna. How did you come up with the idea to do the Apps for Apes? I immediately thought of it when I saw Steve Jobs give his presentation introducing the iPad. As soon as the word ‘app’ became part of our vocabulary, I thought we should have “apps” for apes… The idea just took off from there! Where do you live and is that where you were born? I was born in Michigan and grew up in Southern California, but I live in New York City and consider it home. How long have you been working with and caring for apes? Where do Orangutans live and have you gone there to visit them in the wild? Orangutans only live on two islands: Borneo and Sumatra. Sumatra is in Indonesia. Borneo is divided between the nations of Indonesia, Malaysia and Brunei. Most of the orangutans are on the Indonesian part of the island, which they call Kalimantan. The two Malaysian provinces, called Sabah and Sarawak, also contain wild orangutan populations. What is the oldest Orangutan at your facility? I’m not sure how old the oldest is, but in captivity healthy orangutans can live into their late 50s. Who is the founder of Apps for Apes? I founded Apps for Apes. Our friends in Milwaukee independently took their iPad to the zoo last spring to show the orangutans and we’ve been working together ever since. 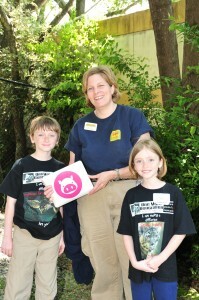 Carter and Olivia: Thanks Richard for all your time and for your passion for wanting to save these amazing animals. We are so excited to be working with you and we look forward to learning more about the success of your program. Here is also a petition we found online which we have signed and we encourage you to do the same: Can you help the cause reach 750,000 members? 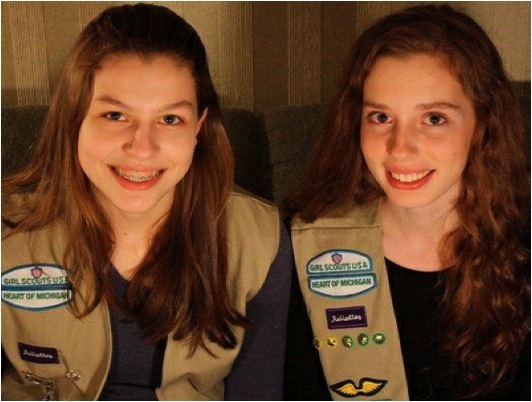 “The palm oil in Girl Scouts’ cookies causes rainforest deforestation, endangers thousands of species (including Orangutans), and contributes to human rights abuses. We wish to thank Richard, as well as, Madi and Rhiannon for their sincere efforts and for being so passionate. It just goes to show you that “Anybody Can Make A Difference“. 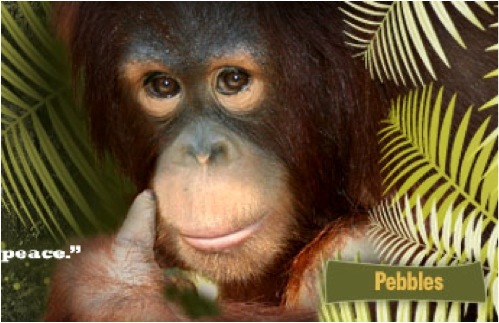 Please consider making a donation large or small to Orangutan Outreach for their amazing conservation efforts in Borneo.